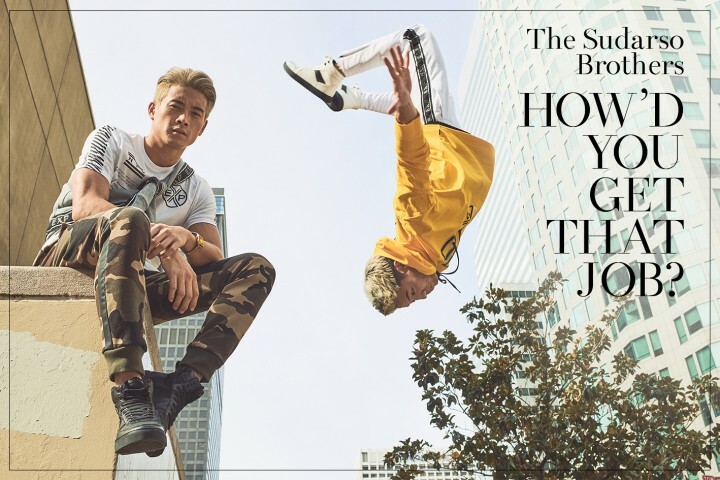 Yoshi and Peter Sudarso, Los Angeles-based, Indonesian-born brothers, didn’t set out to become the most famous actors-dancers-stuntmen-models in Hollywood. Yoshi first pursed mathematics. For Peter, it was architecture. A twist of fate and a heavy dose of hard work landed them leading roles on iconic shows—they were both Power Rangers—loads of modeling and stunt work, a dedicated fanbase (nearly 400,000 Instagram followers and counting), and international recognition in film and television. And all of this in the span of about five years. “We kinda just fell into it,” says Peter, the younger of the two. “It’s been a wild ride.” He’s slightly leaner than Yoshi, with a noticeable spring in his step and sparkle in his eye. That youthful charm is the perfect counterpart to his older brother’s more stoic, yet no-less charismatic intensity. They both have an infectious, palpable energy and optimistic outlook that’s refreshing, inspiring even, in the cut-throat world of Hollywood. Throughout the course of our shoot with the brothers, you’d either catch one spontaneously breaking out some impressive dance moves while the other lets out a burst of lightning-fast martial arts moves. Together, these veritable renaissance men are a formidable duo determined to lead a new wave of art and talent beyond the prevailing winds of Hollywood. The catalyst for it all: blue spandex. Needless to say, those were pretty big, mighty-morphin shoes to fill for relatively green actors. Their early success didn’t just ignite their on-screen careers, it spawned hundreds of thousands of fans who keep up with the brothers on social media. It also sparked a new outlook on their professions. “A lot of what I’ve learned is that you really need a community that’s all about bringing people together,” says Yoshi. “When I first started out, everybody I saw at auditions was my competition. I was very stuck in that mindset, and I had to pull myself away from that because it was so toxic.” Now auditions are a chance to get to know other actors and share our backgrounds. “That way if I don’t get the job, I’m still going to be happy for whoever did.” This revelation inspired Yoshi to start a group where he teaches other actors the art of action moves. “I think it’s important to think of this profession as a community of people coming together and just growing and learning from each other,” Peter adds. Beyond fostering a squad of up-and-coming actors, the Sudarso brothers are determined to take on an even bigger challenge: breaking down the perception of Asian men in Hollywood. This is something that’s close to their hearts and, at this point, the fuel that’s driving them at supersonic speeds. Yoshi and Peter acknowledge that they haven’t seen themselves reflected in Hollywood’s textbook definition of a leading man. But as long as they’re working, hustling, succeeding, they know that everything little thing adds up to one substantial shift. “We’re really trying to get into the door so other people can see that Asian men can obviously be in that position,” says Peter. “And we’re also trying to be the ones who are actively holding the door open so that others can come through.” And not just the door on screen.